The fantastic Architecture/Landscape/Interiors Class of 2010 Installation, Otis Social Space: Landscape Extrusion, has “graduated” from Otis, and will be moving to a new “home”! While we will miss it very much, Otis’ campus is being expanded and redesigned with several new buildings and a new landscape that will not accommodate Landscape Extrusion. The relocated fire lane will run right through its current site! The Otis Community is very excited that one of our Architecture/Landscape/Interiors alumni, Eiko Hamada-Ano (’02), responded to an “adoption offer” posted on Facebook! Eiko responded with immediate action and a future home for “Otis Social Space: Landscape Extrusion” at The Shed, the educational facility operated by Zanja Madre, the non-profit wing of La Loma Development. We are thrilled that this project will be in a public space, operated by a non-profit, and watched over by Eiko, who works at La Loma Development. Here is a message from Eiko, below. 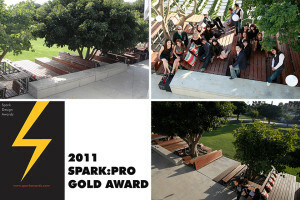 bottom left: “Otis Social Space: Landscape Extrusion” won a “SPARK: PRO Gold Award” in 2011!